Here's a collection box idea with added benefits. The Pop Up Cuboid is the more traditional shape for pop up money boxes and holds a large amount of coins and notes. This pop up collection box is increasingly becoming a popular product for direct mail campaigns with both charitable organisations and companies wishing to encourage donations to local and national charities. As well as plenty of room for coins, our money collection boxes have plenty of room for promotional print and a business marketing message. The pop up action means the collection box will fold flad for esy distribution in the post with economical postage charges. These cardboard money collection boxes arrive in a custom mailer and amaze your recipients when they bounce out full of energy in front of their very eyes. Our pop up cardboard money boxes arrive with real impact so your customer will be taken aback with surprise and focus on your charity marketing. The pop up action means they are immediately impressed and your marketing communication will not be ignored like a boring flat flyer. The Pop Up Cuboid collection box product will remain in focus taking donations on a daily basis whether promoting a serious message for charity or just for fun - towards the Christmas Lunch for example. Money collection boxes for charity can still make a differencce. 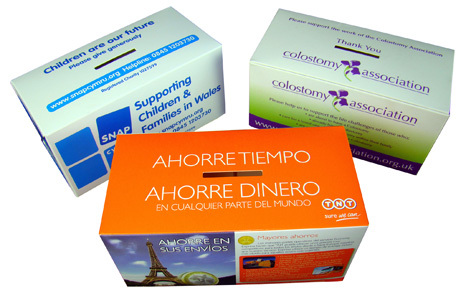 The credit crunch has had a huge effect on charities since everyone has tightened their budget, but with the right design on your Pop Up Cuboid money collection boxes you can still persuade people to give generously. Send a pop up “Give Your Spare Change” collection box for your chosen charity and actively encourage a buzz in the office and generosity from the recipient and their colleagues. 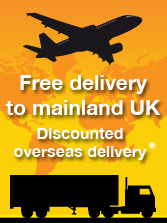 As well as supporting your chosen charity this also offers a good business marketing opportunity for your organisation. The pop up money boxes remain in central focus on a daily basis and attract lots of contributions.